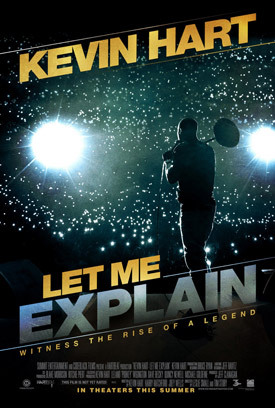 First Clip From Kevin Hart: Let Me Explain. Kevin Hart stars in the new stand-up comedy concert movie. See the movie trailer, clip and movie poster below. Kevin Hart: Let Me Explain puts you in the front row at comedian Kevin Hart’s (Ride Along, Think Like a Man) sold-out Madison Square Garden show and brings you behind the scenes on his worldwide tour. “Kevin Hart: Let Me Explain” captures the laughter, energy and mayhem from Hart’s 2012 “Let Me Explain” concert tour, which spanned 10 countries and 80 cities, and generated over $32 million in ticket sales.